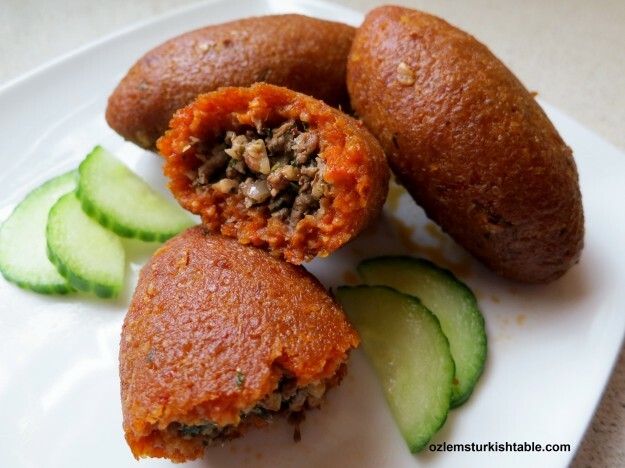 Oruk, or (Sam Orugu as they are also referred) the baked oval bulgur balls with delicious ground meat and walnuts filling, is a very popular dish at my hometown, Antakya (Antioch). It is a very special dish that turns up at my mother’s table at every festive event and family gatherings. 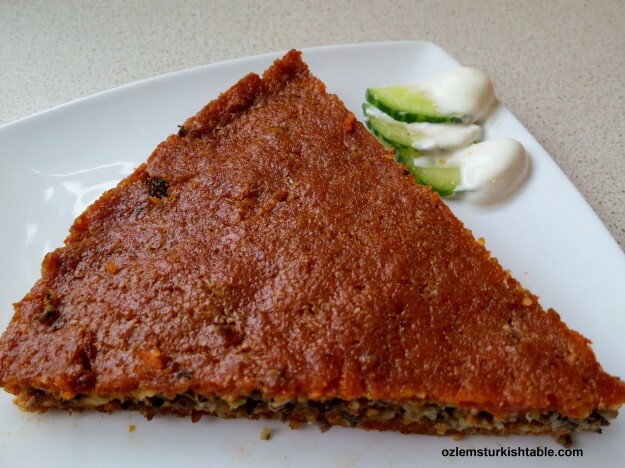 Antakya’s Oruk is a version of the delicious Kibbeh, which is considered to be the national dish of Lebanon. 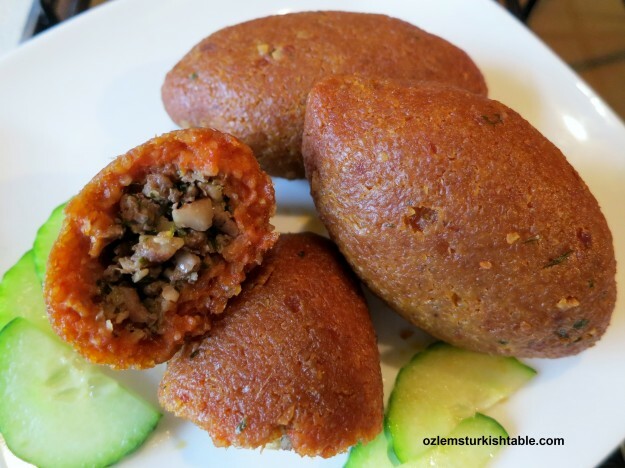 A very popular dish, kibbeh has variations in the Middle East, Cyprus (where it is called koupes) and Turkey. I suppose the difference between them is the spices & some ingredients used (for instance, there is allspice and pine nuts in Kibbeh), as well as the cooking method (Oruk is baked whereas Kibbeh is generally fried). There is also the Turkish Icli Kofte; this one is similar to Oruk, but rather than being baked, icli kofte is first boiled in water then sautéed in oil. If you have made any of these, I would love to hear your experience and perhaps stories behind them. Whenever we go back to Turkey, oruk welcomes us at the first night of our visit, along with mother’s other specialty dishes like Mevlubi; the layers of rice with eggplants, meat, onion or potatoes, Cevizli Biber; walnut & red pepper paste dip or this delicious yoghurt based soup with bulgur balls in it. Surrounded by this special food and the company, we always know that we are back home. 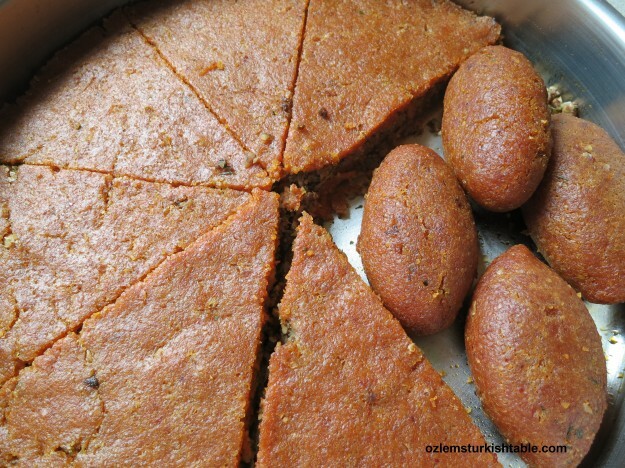 I have been getting requests from readers on how to make oruk or baked icli kofte. Making oruk is a grand event at home; I grew up watching my grandmother and mother making this special treat with family and friends gathered around a big table in Antakya. Some would make the filling, some to prepare the bulgur dough and some to do the stuffing. Since there were no food processors around in those days, they would ground the meat and bulgur with hand held machines. There were lots of kneading and mixing involved and since they would make vast amounts to share and it would almost take a day for this feast to get ready. A lot of effort, but well worth it. Tray baked Sini Orugu is easier to make and equally delicious. A few tips here to ease the process. I suggest you to prepare the filling a day in advance, if you have a limited time. The filling anyway needs to be cool and this really helps with spreading the work. A few readers emailed to say that their bulgur dough couldn’t stay intact. Semolina is the key here; it works great as the binding agent in the bulgur dough. You also need to have water aside and continuously wet your hands while shaping the dough. 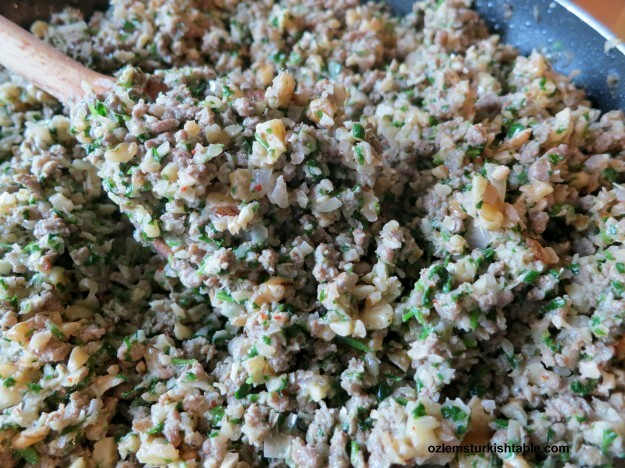 Ground meat that goes in the bulgur dough needs to be extra lean and double ground (you may ask your butcher to do this for you or you can pulse the ground meat in your food processor a few times). 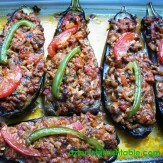 You may also prepare the easier Sini Oruk; tray baked bulgur spread with ground meat and stuffing in the middle. They are both very special treats at the end, quite a sacred food for me and worth all the effort. If you are an oruk, icli kofte or kibbeh fan, I hope you would give it a go and make these delicious treats at home. 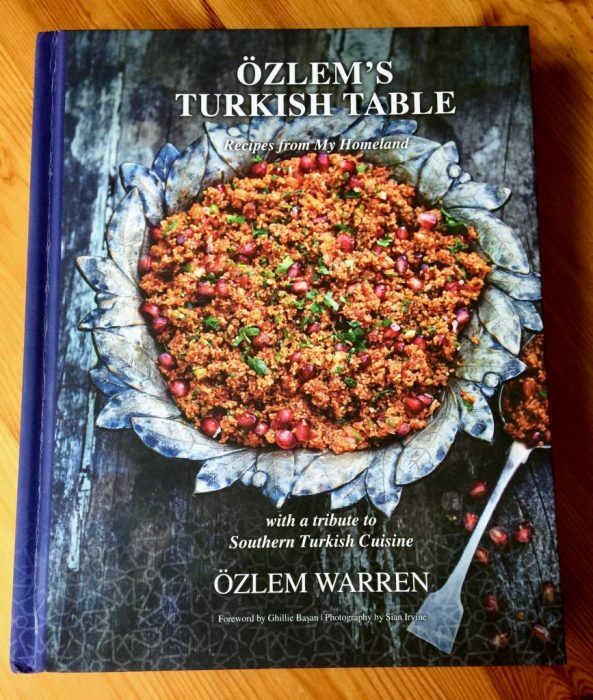 My cookery book Ozlem’s Turkish Table, Recipes from My Homeland has a special focus on southern Turkish cuisine and many regional dishes including this Oruk is included in my book. Here’s the link to my book, if you’d like to get it. Oruk, icli kofte filling with ground meat, onions, walnut and spices. First make the filling, as it needs to cool down (to save time & spread the work, you can also prepare the filling a day in advance and keep in the fridge, covered). Heat the oil in a heavy pan and stir in the medium fat ground beef. Sauté and stir the meat, breaking the lumps into smaller pieces, over medium heat for about 8-10 minutes, until all the juice evaporated. Add the grated onion, salt, ground black pepper and red pepper flakes and sauté for another 5–8 minutes until onions softened and begin to color. Then add the finely crushed walnuts and the chopped parsley, mix well and turn the heat off. Leave aside to cool down (This really is a delicious filling, we couldn’t help having a few tea spoonfuls, it would also make a great pasta sauce). Now, let’s make the bulgur dough. Place the fine bulgur in a large mixing bowl (big enough for you to be able to knead). Stir in the red pepper paste, cumin, salt and red pepper flakes and using your hands, mix them all well. Then slowly pour the 1 ½ cup warm water all over it. Again using your hands, give the bulgur mixture a good mix and make sure all bulgur is wet. Let it rest and absorb the water for 10 minutes. In the meantime, place the semolina in a separate bowl and stir in the ½ cup warm water over it. 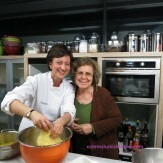 Using your hands, knead and turn the semolina mixture into a soft dough. Semolina is important here as it helps binding the bulgur dough. 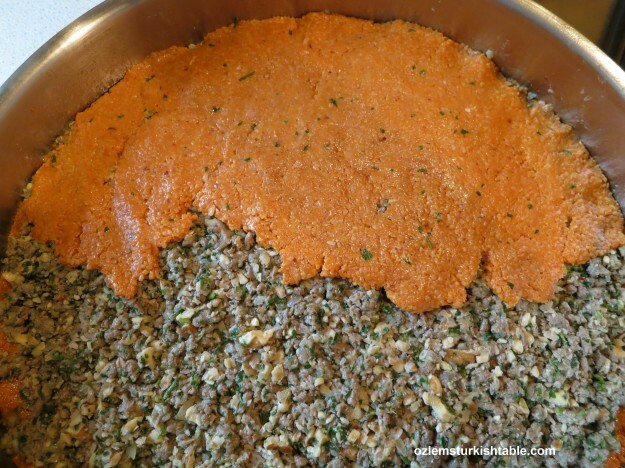 Have the ½ cup warm water bowl next to you and start kneading the bulgur mixture for about 5 minutes. Wet your hands continuously while kneading. Stir in the semolina dough into this bulgur mixture and wetting your hands, knead for another 5 minutes, you will see that the dough is getting more elastic and binding together. Add the double ground extra lean beef to the mixture (you can use your food processor for the meat) and again with wetting your hands, knead for 10 minutes, until you get a smooth, elastic dough. Now, have a bowl of cold water aside to shape the oval bulgur balls; to avoid sticking bulgur dough into your hands and for the balls to stay intact. Wet your hands with the cold water and take a small tangerine size bulgur dough into your palm. Roll it into an oval shape and then using your thumb, hollow out an opening in the middle. Shape the ball into a thin-walled (about ¼”-thick) oval with an opening at one end by molding ball around finger, gradually tapering closed end. Mend any cracks in the shell with a moistened finger. Fill the bulgur shell with about 1½ tbsp. of the filling. Pinch the edges of the bulgur ball to seal and roll into an oval shape. Moisten edges of opening, then pinch the edges of the ball to seal. 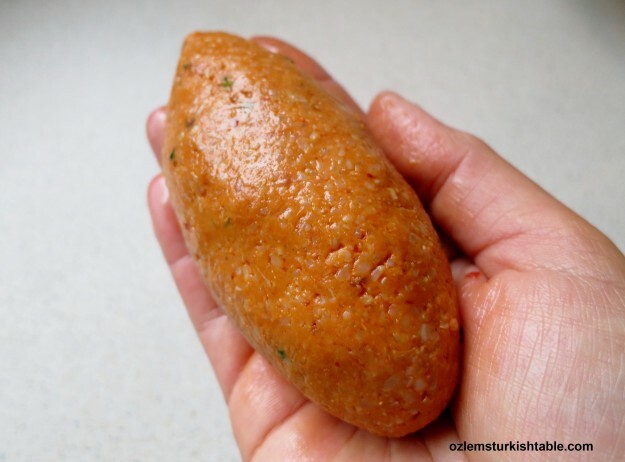 Wet your hands and gently form the stuffed bulgur ball into the shape of an oval with slightly pointy edges. Place it on an oiled tray. Repeat the same shaping with remaining filling and bulgur dough. (I made 5 oruk, oval stuffed bulgur balls and a baked sini oruk, in 32cm / about 12” round baking dish. Alternatively, you can make about 18 oval oruk balls if you like). Place all the finished oval bulgur balls in a well-oiled baking tray and coat them all with olive oil. Sini Oruk is another type of baked icli kofte and this tray baked version is much easier. To make it, divide the remaining your bulgur dough into two. Grease a (preferably) round baking dish of 32” diameter with 2 tbsp. olive oil. Wetting your hands with cold water, spread a thin layer of half of the bulgur dough onto the oiled baking dish. Make sure the spread stays intact; wet your hands and seal any broken parts. Spread the ground meat and walnut filling evenly over the bulgur dough spread, press gently. Place the stretched bulgur dough onto the filling over the round baking dish and bind all together. Grease a chopping board or a work surface with 1 tbsp. olive oil. Take a handful of the remaining bulgur dough and spread with your hands to form a thin layer (about 1/3cm). Place this stretched bulgur dough onto the filling over the round baking dish. Continue until you finish the dough and the top layer is covered, like a patchwork. Wet your hands and bind all the loose ends. (We need to prepare the top layer on another oiled surface so that we won’t press too hard over the filling and break it into parts.). Oil the top layer of the bulgur spread, with about 2 tbsp. olive oil and cut into diamond or triangle shaped slices. Bake both the oval shaped oruk and the tray bake sini oruk in the preheated oven for about 35-40 minutes, until crispy and golden brown at top. Bulgur absorbs olive oil quickly, so coat both oval bulgur balls and the tray bake with extra olive oil towards the end, so they won’t crack. You can serve the Sam oruk, oval bulgur balls warm. 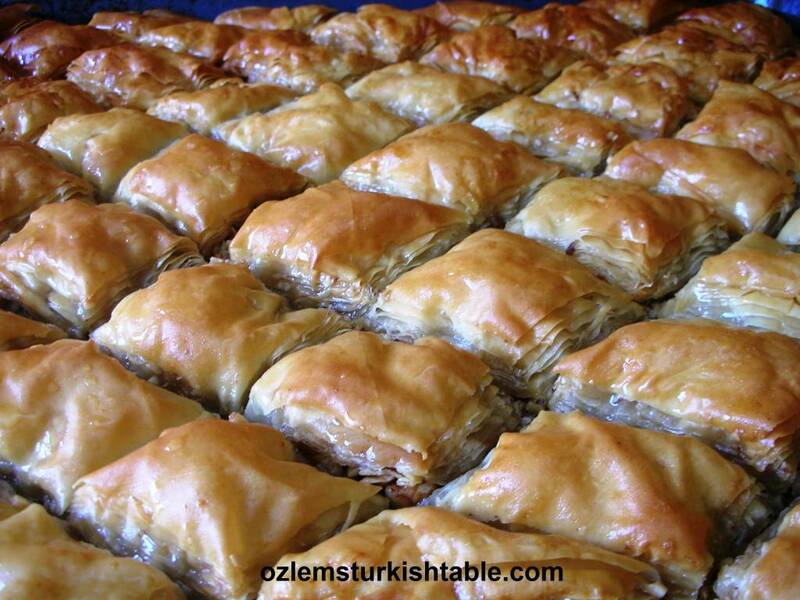 For the tray bake sini oruk, it is best to wait for about 10-15 minutes to cool down so that they won’t break apart. Cooling and refreshing Cacik dip of yoghurt with cucumber and dried mint complements this delicious treat very well. I wanted to finish this oruk, baked icli kofte post with a visual feast of Antakya, Ancient Antioch, a cradle of many civilizations; a hope you can make it to my homeland sometime. I like the idea of baking rather than frying. I have to admit I’ve never ever attempted this recipe but now I’ve read your post I feel confident enough to try. 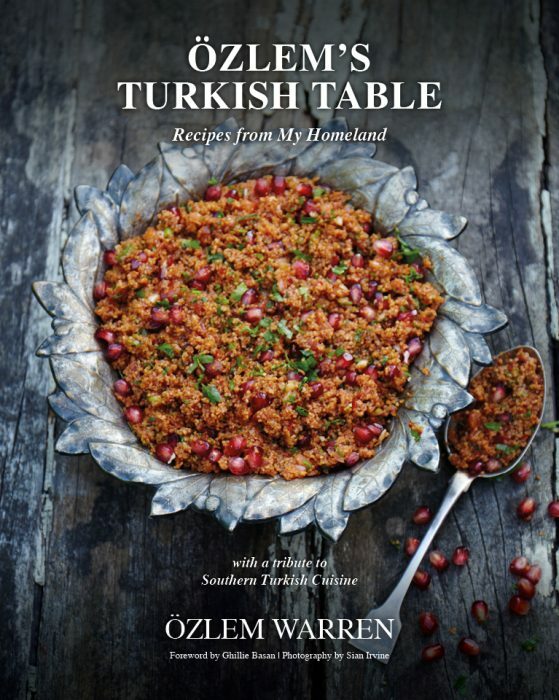 This is a really interesting and delicious recipe:) have loved working with bulgur since you introduced me to it and this really takes bulgur to the next level of expertise:) thanks for simplifying it with simple tips and instructions, Ozlem….look forward to trying it out someday soon. XxPeri. Merci, c’est un régal pour les yeux et un délice pour le palais. Bonjour – Merhaba Sarvenaz : ) you are very welcome! I have always wanted to try making icli kofte but had never seen anyone make it so I thought it might be difficult. Your post today makes it seem doable! I will have to try this out and I will let you know how it turns out. I also like the idea of baking it. Love the step by step photos! This is a fascinating post; not only because it is so detailed and give one confidence to attempt this classic and ancient dish, but also because of the history; Antioch means a lot for the Melchite community of Lebanon (I am talking several centuries ago); as far as the kibbeh, I love your version, even though it is so different from the Lebanese version, which does not use red peppers or semolina to bind the dough. The technique for laying out the pie is similar, although at the end there is a lot of scoring. these types of kibbeh with walnuts and red peppers are an influence from Aleppo which is close to your neck of the woods. Dear Joumana, thank you very much for stopping by and this lovely note; it is fascinating to see similarities and variations for this delicious, ancient dish, I greatly enjoyed hearing how you do it. You are right, there are a lot of influences from Aleppo in the cuisine and in this dish; my grandfather was a fresh produce merchant and used to trade with Aleppo, amazing times. Ozlem, fantastic post and very thorough…I now have the confidence to try this out. Superb. These sound like such a treat and look so impressive. I thought this might be a little too tricky but you’ve made it sound very possible. I too have been put off by the frying method but will certainly have a go with the baking method. Might try the ‘flat’ version rather than the individual kofte. Merhaba Judy, it really is a worthy effort and baked version hase been delightful, hope you enjoy it, many thanks for stopping by. Think I’ll try the sini!!! Thank you so much for your kind note Amy, I am glad semolina did the trick for you too! 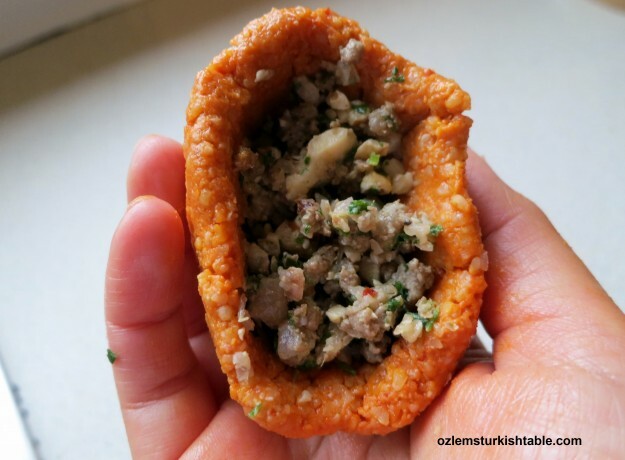 Eline saglik & afiyet olsun, enjoy your oruk, baked kibbeh! Your posts and recipes are great. Thank you did being so enthusiastic about Turkish Food and especially from Antakya. We live in İstanbul bug have visited your home town many times. Of course I love içli köfte but I have never eaten meat in the dough only as part of the filling. Is there perhaps a mistake in the list if ingredients for the dough? Merhaba Ozlem! I cant wait to try this recipe! Do these oruk freeze well or should you just refrigerate them? Merhaba Cali, Oruk freezes beautifully; as it is quiet an effort to make, I do freeze some for a nice surprise later, hope you enjoy it, they are delicious! I made içli kofte and they were delicious! My friend, Mehmet, introduced me to these at a Turkish bakery in north London many years ago, and I thought I’d never get to eat them again. Definitely go to a specialty store and get the FINE bulghur wheat. I used regular bulghur (which I did try to buzz in the food processor) the first time and the dough/coating was too hard and cracked slightly. (They were still good, though!) Thanks so much for the great recipe and the great memories it brings. Merhaba! I lived in Turkey for 4 years, and was married to a man from Kayseri. His family made all of the complicated dishes, including this. I was looking for a recipe where I can make a bunch and freeze them. Have never tried baking icli kofte, so I’m super excited to give this a shot. Merhaba Ozlem! 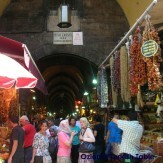 I have a Turkish partner and enjoy trying out new recipes for us to taste in England and your website is great. I’ve made icli kofte before but I’ve always used potato as the binding agent for the dough! It does work but I’m definitely going to try your recipe with semolina.